Susanna Calkins had a wonderful series set in 17th century England, featuring maid turned bookseller Lucy Campion. Those were slightly more serious in tone than this delightful new series launch from this talented writer. Murder Knocks Twice is set in prohibition era Chicago, with all the attendant issues of the mob, the past war, and the depression coming into play. 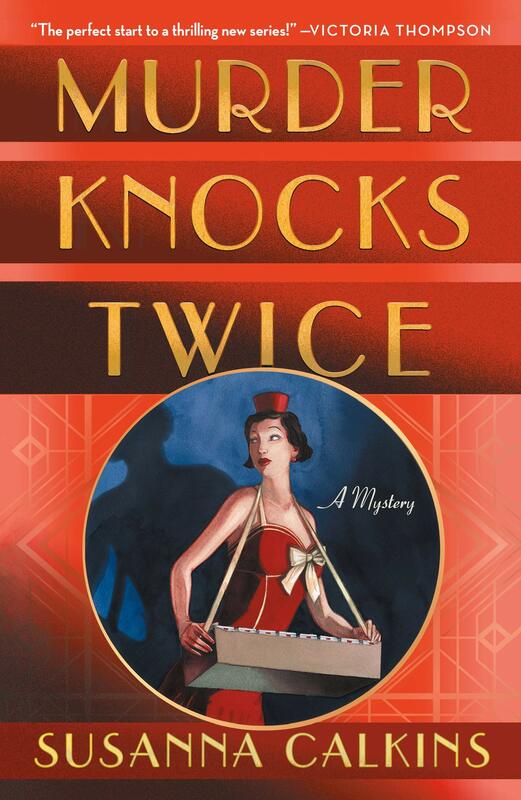 Series heroine Gina Ricci is out of work and finds a job at a speakeasy through a friend. She’s a little unsure about working there – she’s worried about what her father will think, for one thing – and for another, she’s replacing a girl who was killed and that makes her slightly wary. Calkins has a brisk story telling style, and she quickly establishes her setting and a wide array of characters. She’s very good at delineating characters and making them memorable; I was never unsure or trying to remember who she was talking about, and to me, that’s the mark of a very good writer. Calkins sets up Gina’s backstory really well. Her father, who works repairing radios, lamps and clocks (what a faraway time, when those things were repaired instead of thrown away), but now has Parkinson’s and can’t really do much work. Gina fills in for him and loves to tinker. Her mother and brother are both dead, and her mother’s family has never been a part of her life (her father is Italian, and her mother was Irish, which at the time, was a difficult chasm to bridge) so when she discovers the photographer at the club is a cousin who loved her mother she’s delighted. Unfortunately the cousin is murdered right in front of her and her efforts to follow his dying wish causes all kinds of confusion and violence. He was a photographer, and she was asked to hide his camera. Since she loves to tinker and figure things out so she teaches herself photography and learns how to develop film, which helps lead to the solution to the crime(s) in the novel. In this first outing, Gina is not sure who she should trust, and she’s learning a new job as well, so there’s lots of setting and character to establish. One of the more interesting things in the novel was the speakeasy where Gina works as a cigarette girl, and the inner machinations necessary to run that kind of business during prohibition. In film this is well traveled territory and so as readers we may come armed with knowledge, but Calkins still manages to surprise you as you read. This is a wonderful first in a series outing – I’m already hoping for more.